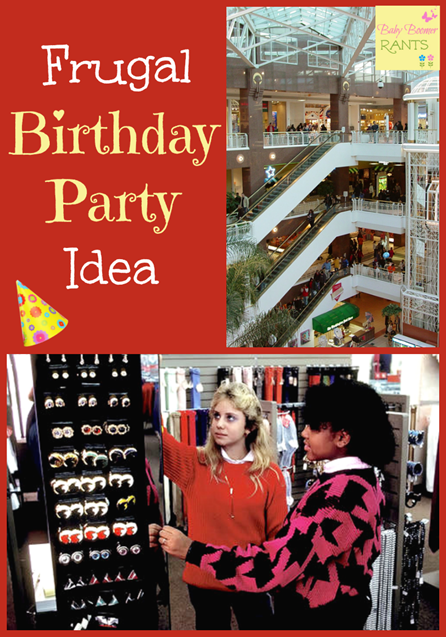 You are here: Home / Family Living / Parenting / Memorable Frugal Birthday Party Ideas For Kids! Memorable Frugal Birthday Party Ideas For Kids! Continuing on with our Frugal Birthday Party ideas, I wanted to share with you what we did for our daughter’s 10th birthday party. The most important part of a kid’s Birthday Party is not how much you spend, but, did it make a lifelong memory for your child? You don’t have to spend a ton of money to make a lasting memory. Our kids are grown and gone and we never spent much money at all on their parties and they remember most of them still. I got to thinking that she was a girl… lol and 10 years old was a big one – double digits and all she would be a teenager before we knew it. So, I thought it would be fun to do a “shopping” party! It would be a sleepover, as was almost every party we ever threw for the boys or her. We would take this group of girls to the mall and let them stay together and we would be close enough, but, far enough away for them to feel good about it and us to feel they were safe. So, our plan was to give her a wallet for her birthday and put some money in it. We never gave our kids money for their birthdays – although I know now that many kids spend their “birthday money” all year. Our kids never had that, so we knew this would be really special for her to open it and find money inside her new wallet. So, these cute little giggly girls got to go on their very own little shopping trip at the mall – “alone”! They had a great time, feeling all grown up and shopping without their parents or siblings tagging along. It was a lot of fun. Again, this is one memory our daughter, at 30 years old, has still not forgotten – so, it was a success! Just remember when planning birthday parties for your kids, they don’t have to be elaborate and cost a fortune to create a lifelong memory. Be creative AND frugal – you CAN do it!